For ither uises, see Lugano (disambiguation). Lugano (Italian pronunciation: [luˈɡaːno]) is a ceety in soothren Swisserland, in the Italian-speakin canton o Ticino, which borders Italy. The population o the ceety proper is 71,500, an the population o the urban agglomeration is ower 145,000. 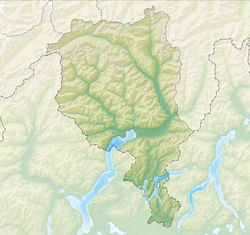 It is the 9t lairgest ceety o Swisserland bi population, the lairgest ceety in Ticino, an the lairgest ceety wi an Italian speakin majority ootside Italy. The ceety lees on Loch Lugano, surroondit bi the muntains o the Lugano Prealps. Its wairm simmers an the fact that in recent years it haes attractit an iver growin nummer o celebrities, enterteeners, an successfu athletes hae gien it the elk-name o the "Monte Carlo o Swisserland". ↑ map.geo.admin.ch (Map). Swiss Confederation. Retrieved 2012-07-17. Wikimedia Commons haes media relatit tae Lugano. This page wis last eeditit on 8 Mairch 2018, at 05:40.